The 2019 New York State Legislative Session is right around the corner, and we have already begun preparations here at UUP. In order for our advocacy efforts to be most effective, we want to engage all members across the state and encourage their involvement. To that end, a webinar is scheduled for Jan. 14 at 12 p.m. to discuss our 2019 legislative priorities. During this webinar, I will be giving a brief overview of each topic and sharing tips on how to speak about these topics with state senators and assemblymembers. There will also be time for questions. Your participation matters. The greater our numbers, the stronger our voice will be when it comes time to advocate. To assist in getting this information to as many members as possible, you will find attached a small handout (4 per page) that can be used to advertise the event through one-to-one conversations, via your member organizers, or at chapter meetings. We’ve also created an image that can be distributed via email or social media. 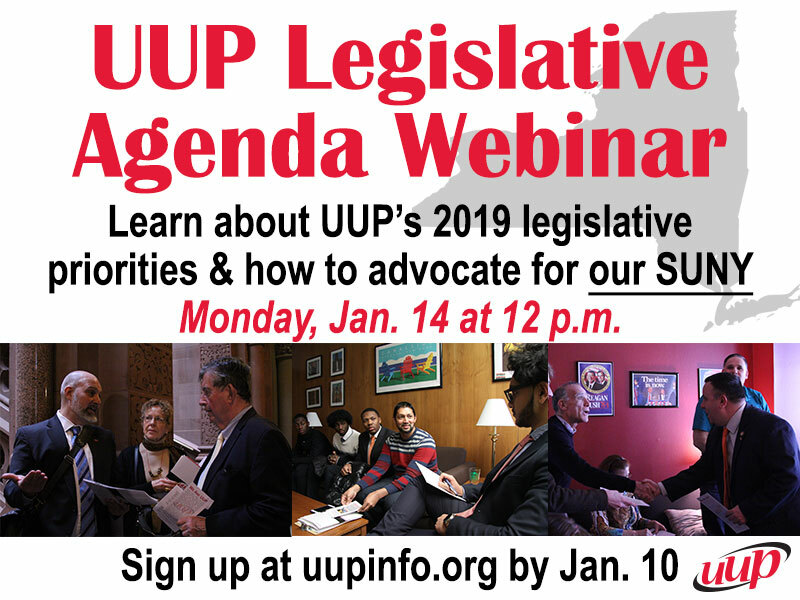 Members can sign-up for the webinar by Thursday, Jan. 10 by visiting https://uuphost.org/myuup/Registration/ADVOCACY/WebinarRegForm.php. This link can also be found on the homepage of uupinfo.org. Call-in details for the webinar will be emailed to participants on Jan. 11. Please contact Celine Mell at cmell@uupmail.org with any questions about the webinar. I look forward to advocating with all of you in the new year.